Your craft is like a portal to your inner world, and as an artist, it's your duty to pull it out of the vortex. Craft is a catalyst for our identity and the soil for cultivating meaning. 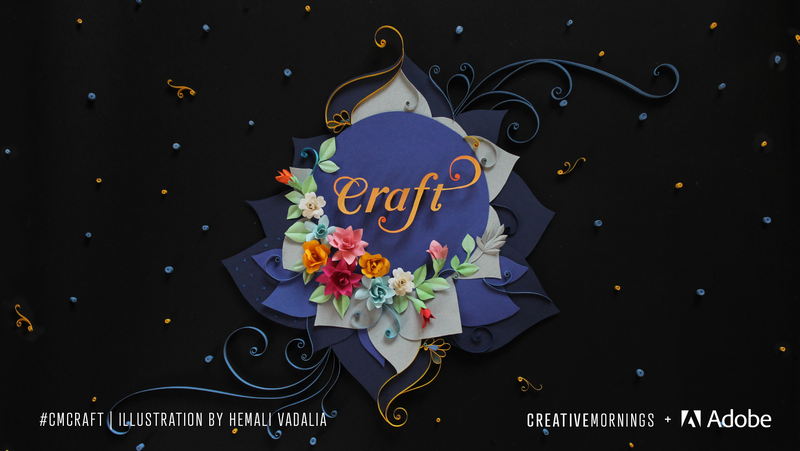 This month's global exploration of Craft was chosen by our Mumbai chapter, illustrated by Hemali Vadalia, and presented by Adobe. Arya Widya Nugraha What is a Craft? Paula Ellert "Ohne Handwerk kein Design." Rachel McKinley "Craft (chocolate) and Creativity"
You have to be tuned in, in moments of the interview, where you're facing severe creative resistance. . . . That's when the story gets great. Journalists are the bird researchers and the public are tiny little wild birds floating around in the universe, completely unaware. Craft es creatividad + técnica que confluyen en un proceso de creación. El diseño experiencial debe buscar generar emociones a través de un proceso de incertidumbre tecnológica para producir resultados impredecibles. It's up to us to turn the tide and bring back the health of the planet so that our future generations can live in a peaceful, beautiful environment. Environmental protection and respect for others all starts on your own doorstep. Where music takes over, where words finish. I could just sense as a stone sculptor can sense that there is a statue within a bit of sandstone, I could sense there was a violin sitting in that log. As a player in the highland tradition he feels that instruments pass energy from the tree that they have picked up from the historic moments when these individuals were around them. That kinetic energy travels through the makers into the wood and then finally is released through the player who picks up energy and is able to hear and understand tunes from that in folk tradition, in that piece of wood. This violin is now an envoy for peace and reconciliation through the power of music and it's in the spirit of Wilfred Owen. My motto and Thorens motto is to give trees a voice and by taking a branch you save an incredible gentle giant and one of the lungs of the earth, which is our prime concern being environmentalists. There is no assembly line. Something's going to go wrong. Something is going to go horribly wrong and more than likely something's going to deliciously wrong. That's the beauty of craft, if you're doing it by yourself, if you're doing it with your hands you're never going to do it the same way twice. What is craft? It feels like something that should be straightforward. But what I'm beginning to learn is that craft is actually a very complex idea. Craft is much more than a way to make an object. It is much more than a way to brand a product. It is even much more than a process. I've lost more good ideas than I've kept. To me the conscious mind is more like a frenemy. The obvious thing, this incredible story, isn't the thing that's going to create the story. Despair can not exist in the presence of love and love can not exist in the presence of despair. I don't want to tell them that I'm the best solution, I want to show them that I'm the best solution. How do I present myself to my client as the owner of the unique solution to their problem? You have to be able to get beyond just having skills. You have to show the people who you work for who you want to view your art, view your work that you can go beyond that. Craft is the opposite of conformity and of perfection. Creating is inherently personal. Our work grows and changes as we do. There is no way to be the perfect artist (or designer or craftsperson). Perfectionism is the enemy of art and of craft, both of which require a love of experimentation and a stomach for failure. We cultivate a more beautiful and meaningful world through craft. You choose beauty or you choose ugliness. You choose craft or you choose neglect. The absence of craft is everything ugly in the world. It's indecision, neglect, shortcutting, lack of attention - it's things falling apart. Beautiful is precision and it's decision. It's attention. It's a sustained effort. It's intention, it's ambition, it's followthrough... It's maintenance. It's everything we care about and actively strive to make better in the world. Craft is responsible for everything beautiful in the world. Anything has the potential to have meaning. We just have to state our intention. It was a transformative experience. I cultivated meaning into something that was formerly mundane. Craft is the process by which intent is transformed into a meaningful existence. Can you impart meaning in an activity through intention? When we set a goal, we state an intention. We do everything it takes to follow through with that goal. That is where the meaning is. How do I diversify my catalogue of meaningful things? What if meaning was a choice that we make? How does one cultivate and diversify meaning in their life? I found success in one area, but it didn't immune me to everything else in life. While I found success in one area, I'd been working so hard towards this one very narrow goal that everything around me just felt like it was being neglected. The world gives you nothing until you give it everything. Maybe I have something here. Maybe this is something that could fulfill this goal that I've had since I was a little kid which was to make a living doing something that i created and something that I loved. I realized early on how committed the listeners I did have were — they were extremely loyal. It seemed like the show was really connecting with the people that were listening. I wasn't doing it for anyone, but myself... and in retrospect it really helped. It was very authentic and it was just something I wanted to do. Great works of art tell very specific stories. As you work on your craft, you learn to develop a certain kind of foresight. . . . I think a true master craftsman will always prepare for any situation that he's in and he'll always know how to maneuver himself. You start the project by starting the project. If anxiety feeds itself, so, too, does confidence. Perfection is the enemy of craft. Perfectionism is the enemy of craft. And I think that the key to my success as an artist and a designer and as a craftsperson has everything to do with me letting go of perfectionism. Escribir para hablar del desasosiego, de las veces que nos caemos y de las otras tantas que nos levantamos. Escribir porque la palabra nos pertenece a todos y porque a final de cuentas nuestro corazón es el mejor taller literario. When it comes to craft, and relating to people, and doing your job well, connections are ultimately all that matters in the end. Banish anticipatory fret from your lives. And every time you catch yourself doing it – stop it. You can’t control that anyway, so just enjoy the now. Count your blessings – today and every day. When you’ve known discomfort, when you’ve known fear and terror and illness, I think it just helps you relate better to people. Don’t take yourself too seriously but take the work seriously. We creative types are fed a lie and that is we should be paid less because we get to do what we love. . . . I'd argue that we should get paid more because we have the guts to do what we love. Your dream job is not your dream job if it doesn't pay you what you're worth. Quality is the goal of all craftsman. In order to be a successful artist, you must master your craft. Success is not money and money is not success. Your dream job is not your dream job if it doesn’t pay you what you’re worth. Focus on quality. Quality is the goal of all craftsmen. Remember the first step to finding your craft: you do you. Having a passion for something alone does not guarantee success, and pursuing that passion does not guarantee success either. You’ve got to earn it. The world needs more beauty and I think that you have it within you. Have you all met someone new here today? Because everyone in this room is creative and awesome! I put myself in this creative rut because I had to, there was no other option, it was my job, I had to do it. The one thing that I heard constantly from my friends at the time was, "I can't do that! I'm not crafty!" I am here to prove everyone wrong who thinks that. That is my life mission. Even though you might not know something today, it doesn't mean you won't know it tomorrow. You can see stuff that you see everyday, use your brain to sort of bend the world around you and make it something else. Allow your imagination to be a raw material. Why is it great to create? Because it's enjoyable. It's fun making stuff—you start with nothing and end up with something else. Being creative opens up new ideas, exercises our brain, and makes us feel good. I like to say that I haven't sold my soul, I merely licensed it. Doodling, for me, is thinking and making at the same time. You can doodle with sound! It doesn't have to be an image. It can be a noise, a melody. It's about playing around with something. A doodle is when you're making something intuitively and you're not quite sure what it's going to be, but you feel good about what it is you're doing. I would choose graft over craft. It's about making stuff. I'm not really sure I'm down with craft that much. I'm a little bit anti-craft. I think we should switch out skills for ideas. June 14 Jenny Theolin - All hands on deck! June 15 Тетяна Фіщук: "Craft. Чи є майбутнє у ремесл в епоху інформаційних технологій?" June 15 Curio & Co.
June 29 Andrei Ignia on "Craft"